The interplay between culture and economy is vast and profound. As the Global Center for Cultural Entrepreneurship points out, “…wherever culture is thriving cultural entrepreneurs are busy building businesses and organizations that express ideas, values, traditions, perspectives – sharing across cultures through markets and commerce.” On a global perspective, these cultural activities translate into $646 billion in annual global exports of cultural goods and services, according to UNESCO. How a friend described the relationship of culture and politics to me is also applicable to culture and economy: culture is economy in the raw. This integration of culture in the economy and vice versa is fertile ground for seeding change. Cultural entrepreneurs have this enormous advantage to effect change down to a personal and community level. According to Tom Aageson, author of The Cultures and Globalization series, “(e)ntrepreneurship in the cultural economy has the power to change an entire community’s economic trajectory.” Take into account as well the Cambrian explosion of digital and social technology – you will then see the radical potential for cultural entrepreneurs to disrupt traditional means of value creation, distribution, and signification of meaning. This realisation was a driving force behind an initiative that brought my friends Patricia Gonzales, Michael Dizon, and I together. With passion and joy, and on the first day of spring, we started Kultura Co. ‘Kultura’ means ‘culture’ in Filipino; ‘Co’ stands for companies, community building, and collaboration. Culture lies at the heart of nation-building. It underpins our lives as individuals and as a nation, and is the fourth pillar of sustainable development. Cultural entrepreneurs are catalysts for prosperity and innovation. They see potential, create opportunities, and design goods and services that have meaning for both makers and users. They are in the business of promoting identity and heritage, enriching experiences and human connections, and fostering sense-making and creativity. They help shape and re-shape the economic, environmental, and sociocultural life of communities. We are all stakeholders in the development of our communities, countries, and peoples. Filipino cultural entrepreneurs are in a unique position to foster economic and social development. In our own small way, we want to help them as they change our world. We commit to celebrate and support Filipino cultural entrepreneurs by providing creative and innovative solutions to the products and experiences that cultural entrepreneurs generate. 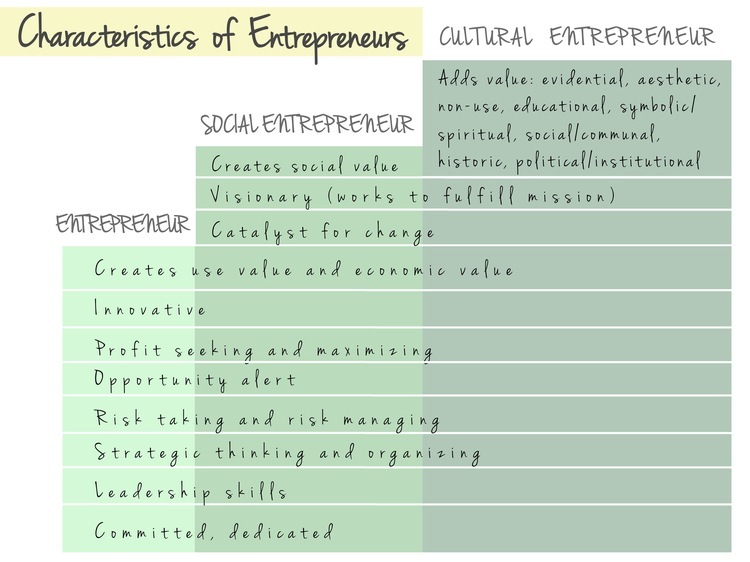 Like social entrepreneurs, cultural entrepreneurs (CEs) maximize mission and profit but this mission is framed in terms of how culture enhances quality of life – for the people who create products or experiences, those who consume or practice them, and for society in general. CEs generate profit from cultural activities and connect cultural products and experiences (and their creators) to market. Cultural activities refer not only to the tangible items that are the products of human intellectual and creative work (e.g., art/craft, the built environment), but also the intangible expressions of a way of life (e.g., traditional knowledge, rituals). In the process of creating financial returns for themselves, CEs bring to market goods and services that have built-in significance for their consumers. As a result, consumers engage with cultural products and experiences more deeply and more personally than with other kinds of wholesale goods. For us at Kultura Co, organizations that can serve and promote tangible products and intangible expressions are justifiably cultural enterprises that deserve support. Reprinted from Kultura Co. with permission. Figure adapted from Abu-Saifan, S. 2012. Social Entrepreneurship: Definition and Boundaries. Technology Innovation Management Review. February 2012: 22-27 and Moss, S. (2011). Cultural entrepreneurship. In B. Walmsley (Ed. ), Key Issues in the Arts and Entertainment Industry (Vol. 56, pp. 161–177). Oxford, UK: Goodfellow. As an entrepreneur myself, what excites me the most about cultural enterprises is how their goods and services already possess intrinsic value proposition. It already has built-in significance for consumers because they already recognise its connection to their own heritage, aspirations, and normal or unique experiences as members of different tribes. Applying the lens of cultural entrepreneurship to your business might uncover a new value proposition layer for your brand. Perhaps it can spark new connections between your existing products and services, inspire you to communicate differently your marketing message, discover new touchpoints with your target group, or even gain an entirely new audience. We at Kultura Co. are in the process of tinkering with this kind of framework. Think “cultural entrepreneur value proposition canvas” of sorts. I’ll certainly keep you updated on this. In the meantime, here are some examples of how cultural and creative activities were instrumental in delivering added, if not, new value to business propositions, and achieving organisational goals. In all of these cases, the addition or surfacing of a cultural dimension has resulted in something that is far greater than the sum of its parts. One evolved from a fashion brand into a ‘stylish social statement’. Another spins new creations by crocheting and knitting, but at the same time helps their target audience reimagine their identities and rebuild their lives. And the last one was able to win community buy-in and sustainability for their clean and green project by 1) appealing to their community’s sense of identity, and 2) turning the project into a source of community pride. Connect with us at Kultura Co. You’ll also get hand-picked stories, trends, and information on cultural entrepreneurship. I’m very passionate about content, because I’m passionate about people. Content is just another means to solve problems and elevate people to greater heights. This is what I want my website / blog, and social networks to do for people like you and me. I don’t have all the answers, but I would like to share everything I have and will learn in this quest.